Meet MMHS Board Member Dr. James Waler and learn why he loves Mandarin. 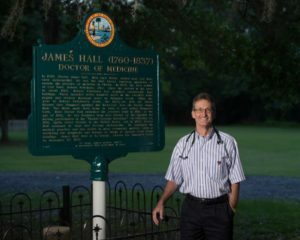 Jim chose the historical marker of a very important physician, historically speaking: Dr. James Hall. “My name is James Waler, and I am one of the newer members of the board of the Mandarin Museum & Historical Society (MMHS). Although I am relatively new to becoming involved in the MMHS, I did become a member of the Mandarin Community Club (MCC) almost immediately after relocating to Mandarin in 1990. Originally from Miami, where I completed my undergraduate and medical school studies at the University of Miami, I spent 4 years in the pediatric department at Shands hospital at the University of Florida in Gainesville. My wife and I moved to Mandarin in 1990 after discovering its natural beauty and majestic oaks, and it is where we raised our three children. Since arriving in Jacksonville, I have practiced pediatrics, originally with the Jacksonville Healthcare Group, which eventually aligned with the Baptist Primary Care group. Even though I have remained busy with my practice and family life with three children, I have always been intrigued by the history of Jacksonville, and specifically, Mandarin. Like many local residents, I assumed MMHS was part of the MCC. With my interest and desire to support the efforts of maintaining the awareness of our local history and to try to expand the membership of the MMHS, I was honored to be asked to join the board of MMHS.